On February 6, 1898, a group of theater managers met to discuss some business matters. The men decided to take a walk along the tide flats, and upon reaching the shipyards, settled upon some pilings, where the conversation took a philosophical turn. Combining their ideas on democracy and brotherhood, it was decided that an organization should be formed to reflect this spirit, an organization called the "Seattle Order of Good Things." Later renamed the "Fraternal Order of Eagles," the society's constitution asked its members to "make human life more desirable by lessening its ills and promoting peace, prosperity, gladness, and hope." Within 10 years the Eagles had 1,800 lodges scattered throughout the United States, Canada and Mexico, boasting a membership roll that exceeded 350,000. Members received free medical attention (as did the individual's family), weekly payments in case of sickness and a funeral benefit--all valuable services before the widespread availability of medical, disability and life insurance. More importantly, they formed a powerful voice that advocated various types of reform that would benefit the average working person. 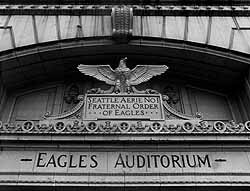 The Eagles Auditorium Building helps commemorate Seattle's role in the history of this fraternal organization. 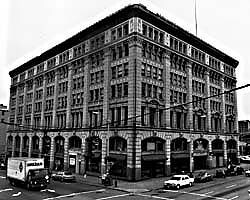 In 1924, the Seattle chapter built itself a larger home, aiming for an impressive elegance that would attract new members and make Aerie #1 the largest Eagles Lodge in the nation. The Eagles Auditorium Building is one of Seattle's most beautiful terra-cotta buildings, and its Renaissance-revival styling manages to be both serene and imposing at the same time. Dominating the interior is a large ballroom, which features a balcony, an elaborate polychromatic ceiling and other decorative elements. It was renovated in 1995 to become the new home of the ACT Theater. The Eagles Auditorium, now known as Kreielsheimer Place, is located at 1416 Seventh Ave. at the intersection of Union St. Parts of the building are open to the public. For more information and performance schedule call 206-292-7676 or visit the theater's website.